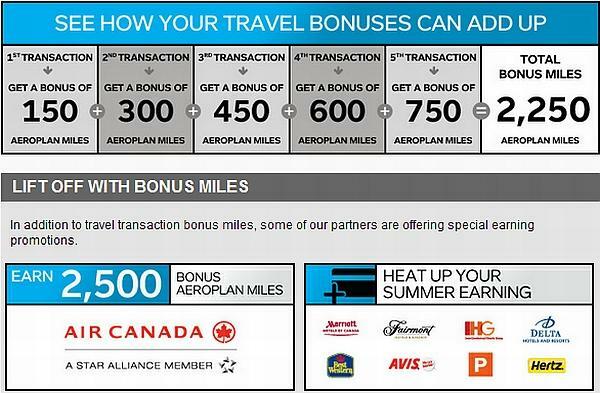 Aeroplan is offering bonus for transfers in from number of loyalty programs excluding US based Amex cards. There doesn’t seem to be a requirement to register for this promotion in advance. The bonus is 20% for transfers at 5K, 20K, and 50K levels, 25% at 100K, and 26.7% bonus at 150K. My favorite program to transfer out is Starwood Preferred Guest. For transferring 80K SPG would eventually become 125K Aeroplan miles. SPG gives a 5K bonus for every 20K transferred so 80K transfer would actually be 100K when it hits the Aeroplan account. This then gets the additional 25% promotional Aeroplan bump. Aeroplan used to be one of the favorites Star Alliance programs to redeem international business and first class flights. Award chart adjustment and starting to charge YQ’s (fuel surcharges) for number of redemption partners have made the program less attractive as of late. But if you have some miles sitting on your Aeroplan account and would need to top it, this is the perfect opportunity to do so. Please note that while Membership Rewards® points from U.S. American Express Cardmember accounts may be converted into Aeroplan Miles, their conversion is not eligible for the bonus promotion. Maximum 40,000 Bonus Aeroplan Miles can be earned per Aeroplan Member. Bonus offer valid only on conversions made between May 21 and June 18, 2012 (11:59 EST). Bonus Aeroplan Miles will be issued by Aeroplan as follows: 1,000 Bonus Aeroplan Miles will be deposited into the member’s account when the total Aeroplan Miles earned by converting points from any combination of eligible partners programs during the promotion period is between 5,000 and 9,999 Aeroplan Miles; OR 2,000 Bonus Aeroplan Miles will be deposited into the member’s account when the total Aeroplan Miles earned by converting points from any combination of eligible partners programs during the promotion period is between 10,000 and 19,999 Aeroplan Miles; OR 4,000 Bonus Aeroplan Miles will be deposited into the member’s account when the total Aeroplan Miles earned by converting points from any combination of eligible partners programs during the promotion period is between 20,000 and 49,999 Aeroplan Miles; OR 10,000 Bonus Aeroplan Miles will be deposited into the member’s account when the total Aeroplan Miles earned by converting points from any combination of eligible partners programs during the promotion period is between 50,000 and 99,999 Aeroplan Miles; OR 25,000 Bonus Aeroplan Miles will be deposited into the member’s account when the total Aeroplan Miles earned by converting points from any combination of eligible partners programs during the promotion period is between 100,000 and 149,999 Aeroplan Miles; OR 40,000 Bonus Aeroplan Miles will be deposited into the member’s account when the total Aeroplan Miles earned by converting points from any combination of eligible partners programs during the promotion period is 150,000 or more Aeroplan Miles. Conversion of Membership Rewards® points from U.S. American Express Cardmember accounts into Aeroplan Miles are not eligible for this promotion. POINTS.com: Aeroplan Miles procured via a Trade transaction with another member on Points.com are not eligible towards the conversion bonus threshold. BONUS MILE CREDITING: Bonus miles are credited 7-10 days following successful receipt by Aeroplan of a conversion transaction from the partner. 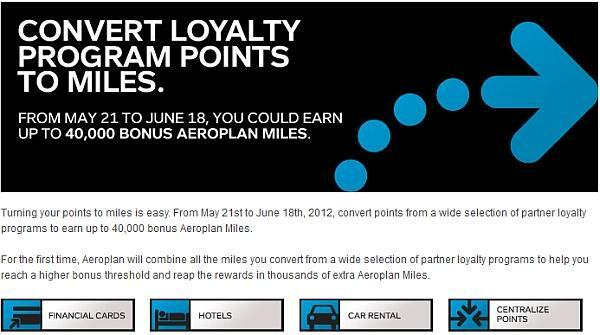 Note that some partners may take up to 2 weeks to submit point-to-mile conversions to Aeroplan. All other trademarks are the property of their respective owners. This promotion is apparently limited to the first 20000 participants, but I am not 100% sure if they will go by that. When they run the Radisson promotion in 2011, they let the registration be open right until the end. There are likely far more people that sign up for these, but don’t then actually do the required stay. You need to watch a short promotional video about the Park Inn by Radisson brand before you can register either using your Club Carlson account number or the email address that you have on file with them. For some reason I didn’t receive a confirmation email that I received for the other Club Carlson promotions. When I tried to register again, it did give me a message that I was registered. So, just in case, take a screenshot of your registration. The first 20,000 people to register for the 1 + 1 Stay One, Get One Offer will be eligible to receive 44,000 bonus Gold Points® – enough for a free night at any Park Inn hotel worldwide. Register for the Promotion by clicking on the “Register Now” button below. You’ll need to be a Club CarlsonSM member to register. Not a member? No problem, just follow the “Join and Register” link after the video. Complete a qualifying stay at any Park Inn by Radisson around the world between May 22 and July 22, 2012. The 44,000 bonus Gold Points® will be deposited into your Club Carlson account within 6 – 8 weeks of completing your qualifying stay. That’s enough points for a night at any Park Inn by Radisson around the world.Register and Book your Stay Today! AND, the 44,000 bonus Gold Points are in addition to the number of standard Gold Points awarded for your stay. PLUS, if you book your stay on parkinn.com you will earn at least an additional 1,000 bonus Gold Points with our online booking bonus. The “1+1 Stay One Night, Get One” Promotion (“Promotion”) is available only to Club CarlsonSM members. To be eligible for the Promotion, members must register online for the Promotion at http://www.parkinnoneplusone.com (“Promotion Registration”), provide their Club Carlson member number at the time of reservation or check-in of the Qualifying Stay, and then complete one Qualifying Stay at any Park Inn hotel worldwide (“Participating Hotels”). Guest must check in for the Qualifying Stay on or after May 22, 2012 and check out must be completed no later than July 22, 2012 (“Promotion Period”). A “Qualifying Stay” is defined as a stay of one or more consecutive nights in the same room at a Participating Hotel regardless of the number of check-ins or check-outs on a rate for which Gold Points are awarded in accordance with the Club Carlson Program Terms and Conditions. Guest must be present at the Participating Hotel at both the time of check-in and check-out, enrolled in Club Carlson at or before the time of check-in, and registered in the Promotion no later than the time of check-out (to enroll in Club Carlson, visit www.clubcarlson.com). The first 20,000 guests who complete the Promotion Registration will receive 44,000 Bonus Gold Points after the completion of their Qualifying Stay. After the first 20,000 Promotion Registrations, every guest who completes the Promotion Registration will receive 15,000 Bonus Gold Points after the completion of his/her Qualifying Stay. These Bonus Gold Points are in addition to the standard Gold Points awarded for a stay. 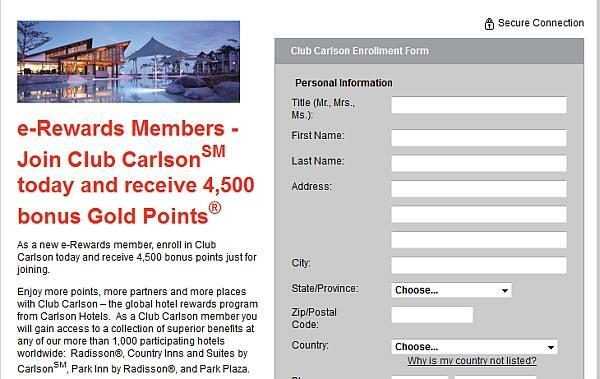 Only one Club Carlson account per Qualifying Stay will be credited with the Bonus Gold Points. Maximum of one Bonus Gold Point award will be credited to a member with a Qualifying Stay under the Promotion regardless of the number of Qualifying Stays completed by the member during the Promotion Period. Allow 6-8 weeks for the Bonus Gold Points to post to the member’s account. The Promotion and Gold Points are subject to all Club Carlson Program Terms and Conditions. Rates for each night of a Qualifying Stay may vary and promotion is subject to availability. Promotion void where prohibited by law. To the maximum extent permitted by law, Park Inn reserves the right to add, modify or discontinue these terms and conditions or the Promotion at any time with or without notice. Park Inn is not responsible for: interrupted or unavailable network, server or other connections, miscommunications, computer hardware or software or technical failures, Internet Service Provider/network/website accessibility or availability, garbled or jumbled transmissions or other errors of any kind, whether human, mechanical or electronic; including without limitation the incomplete, incorrect or inaccurate capture of Promotion Registration information and any late, lost inaccurate or misdirected Promotion Registration information. By participating in this Promotion, you agree and consent to these terms and conditions. Club Carlson is simultaneously running a stay one get one promotion with three of its’ brands. 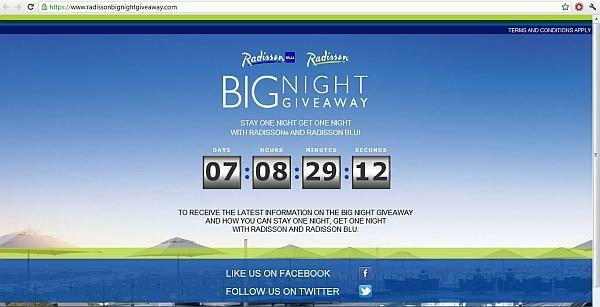 They have already launched the Radisson/Radisson Blu Big Night Giveaway and Country Inn & Suites Stay 1 Get 1-promotions. The enrolling for these two has been now open for a week. You can start signing up for the Park Inn by Radisson version in less than 24 hours. The registration will be open from noon CET on May 22nd, 2012. You will receive 44K Club Carlson bonus points after one paid stay at any Park Inn by Radisson property. Although the promotion is branded Pay 1 Get 1, you can actually do much better as well. You can use the points for any Club Carlson property that start at 9000 points per night. The high end properties require 50000 points per night. Club Carlson just released a list of hotels moving up/down in award categories. The number of hotels changing in award categories is 269. The change will take place on May 31st, 2012. You will have until May 30th, 2012 to book at the old levels. InterContinental Hotels Group, Starwood Preferred Guest, and Marriott already did their category changes earlier this year. Club Carlson was kind enough to release a list of hotels moving up and down broke down by markets. It is quite surprising that the number of properties moving up 141 is closely followed by the number of properties moving down 128. Here’s a reminder how many points per night different category Club Carlson properties require. If we are looking the overall category shift, the largest number of properties moving up are in category 2 and 3. Move up from category 2 to 3 almost doubles the number of required points per night. Shift from category 3 to 4 is almost as bad. When we look at the category shift down, about 80% of the moving properties are in the same categories 3 and 4 as on the previous diagram. Below you can find the category shift happening in different regions both up and down. Here’s the full list of properties changing in categories per Club Carlson. Radisson had a similar promotion at the end of last year. It must have been a very popular for them as it returned for the 2012 as well. All you need to do is to watch a short promotional video after which you can register for the promotion. If you don’t have a Club Carlson account yet, you should open one using the eRewards promo (4500 bonus points but might have expired) or using another link (2000 bonus points). After the registration you need to have one paid stay at any Radisson or Radisson Blu property worldwide by July 15th, 2012 and you will be then granted 50000 Club Carlson bonus points. This is in addition to the usual points that you will earn from the stay. This promotion is available for the first 100000 registrants. Last year, they didn’t close the registration. Not sure how they are going to handle it this time around. If you are planning to do a Radisson stay during the promotional period, you probably should register now. You will receive an email confirmation after successful registration for this promotion. If you have status with a competing chain, Club Carlson can also match it. I wrote about how to do a Club Carlson status match couple of days ago. The 50,000 bonus Gold Points® will be deposited into your Club Carlson account within 6 – 8 weeks of completing your qualifying stay. That’s enough points for a night at any Radisson or Radisson Blu hotel around the world. Club Carlson has had this elite offer going on for couple of years for weekend stays. You need to stay for Wednesday and Thursday or Thursday and Friday, and you will get Friday and Saturday or Saturday and Sunday for free. This offer is valid at participating Club Carlson locations in Europe, Middle East, and Africa. The only available property was the Radisson Blu resort in the neighboring Sharjah. This is only 20 to 30 minutes away from Dubai in a cab. Just did the ride couple of weeks ago. As you can see from the rate details, the charge is 300 AED per day for the first two days and the day 3 and 4 are free. The average daily rate is only 150 AED. This 300 AED rate is not the lowest as the hotel is offering rates that are discounted by 10%. But it is definitely not a bad deal. 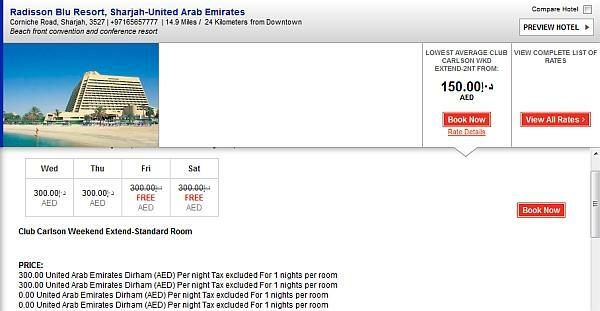 There are quite a few hotels in Dubai where this rate is not available at all. Then there are hotels where it is available, but just not during the dates I was looking at. You can pull up the rate calendar and instantly see the dates when the rate is offered. This is a fantastic discount offer for Club Carlson Gold and Concierge level elite members. You can save a significant amount of money by saving over the weekend. Also, the rates that the discount is given are not inflates as is often the case with some other chains like InterContinental. I wrote apiece about getting a status match with Club Carlson if you have a status with a competing chain. Club Carlson is offering direct status matches up to the Gold-level in their program. I have previously covered Starwood Preferred Guest, Hilton HHonors, Marriott, and Hyatt Gold Passport status match procedures. If you are Rezidor shareholder, you qualify for Gold status as a shareholder benefit. Club Carlson matches to their Silver or Gold level only. The highest status with the Club Carlson is Concierge, but this is, at least officially, off-limits when it comes to matches status. Club Carlson matches Hilton, Hyatt, InterContinental Hotels Group/Priority Club, Marriott and Starwood status. 2. Take a screenshot from your Hilton, Hyatt, Priority Club, Marriott, or Starwood online account statement that shows your status. You should hear back from Club Carlson normally within one business day. I emailed my request during the weekend and heard back from them on Monday. As you can see from the email I sent, I mistakenly requested a Platinum match. Club Carlson doesn’t have a Platinum status, but only Silver, Gold, or Concierge. So, if you manage to swing by and stay a night at each of these three different brands during the promotional period, you should earn 138000 Club Carlson bonus points. Highest category award nights require 50000 Club Carlson points per night, although redemptions start at 9000 points. 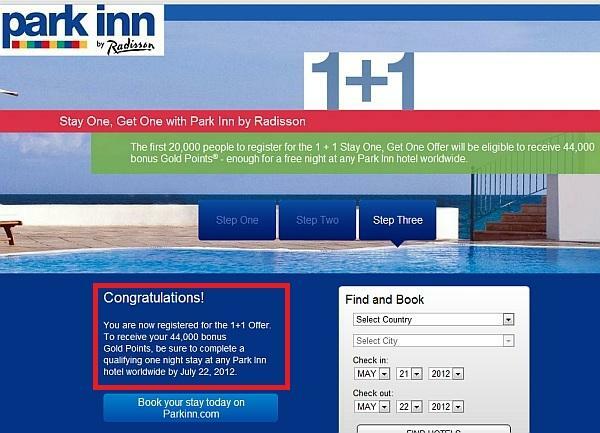 And yet another one for Park Inn properties for 44000 Club Carlson points for a stay. The link for this specific website doesn’t seem to be up yet. Guest must be present at the Participating Hotel at both the time of check-in and check-out, enrolled in Club Carlson at or before the time of check-in, and registered in the Promotion no later than the time of check-out (to enroll in Club Carlson, visit www.clubcarlson.com). The first 100,000 guests who complete the Promotion Registration will receive 50,000 Bonus Gold Points after the completion of their Qualifying Stay. After the first 100,000 Promotion Registrations, every guest who completes the Promotion Registration will receive 15,000 Bonus Gold Points after the completion of his/her Qualifying Stay. These Bonus Gold Points are in addition to the standard Gold Points awarded for a stay. Only one Club Carlson account per Qualifying Stay will be credited with the Bonus Gold Points. Maximum of one Bonus Gold Point award will be credited to a member with a Qualifying Stay under the Promotion regardless of the number of Qualifying Stays completed by the member during the Promotion Period. Allow 6-8 weeks for the Bonus Gold Points to post to the member’s account. The Promotion and Gold Points are subject to all Club Carlson Program Terms and Conditions. Rates for each night of a Qualifying Stay may vary. Last year Club Carlson run a similar promotion for 50000 Club Carlson bonus points for a stay at Radisson or Radisson Blu property by December 30th, 2012. If you don’t have an account with a Club Carlson yet, you should open it using an offer from e-Rewards to get 4500 bonus points. You can also get a status match if you have a status with a competing chain. You can just email the request to goldpointsplus@carlson.com with a copy of an online account statement from the competing chain. When I did this back in February, I received a response from Carlson within one business day. Club Carlson is again offering bonus points for signing up for their program. This offer was emailed to e-Rewards members, but you should be able to take advantage of it as long as the registration form includes the ERWD2012 promo code. I already posted about this offer back in March, but thought that it would be good time to remind about it now. There is a new Club Carlson promotion starting on 15th of May, and you probably should open up an account using this promotion to get additional 4500 points. e-Rewards members must enroll in Club Carlson using the link provided via email by e-Rewards by May 31, 2012 (“Promotional Period”). This offer is limited to a maximum of 4,500 bonus Gold Points per person. Offer only valid for new Club Carlson members without an existing account. Promotional bonus Gold Points will be posted to the member’s Club Carlson account within 6-8 weeks of enrollment date. The name on the e-Rewards program account and Club Carlson account must be the same. Offer is valid only to the enrolled recipient, is non-transferable, may not be sold, and is subject to change or termination without notice. By enrolling in Club Carlson and participating in this offer, you agree to the Club Carlson program terms and conditions. Both Hyatt and Starwood had their new promotions starting at the beginning of May. Carlson Hotels, Marriott, and Ritz-Carlton don’t currently have promotions going on. I will continue to patronize Hilton and InterContinental Hotels Group due to their current promos and will probably max out the Hyatt’s airline related promotions as well. Personally I am very underwhelmed about the SPG’s summer promotion of 2012. Accorhotels is offering triple points for weekend stays until June 10th, but these need to be booked by May 10th, 2012. Also there is an offer for 500 Le Club Accorhotels points for playing a game on their Facebook page (no Facebook account needed). There is another offer for 1000 Delta SkyMiles or Air Canada Aeroplan miles for a stay by May 31st, 2012. You can earn this only once. Best Western’s promotion for a $50 travel card started on April 15th and ends on June 3rd. You can also earn Air Canada AeroPlan bonus miles + bonus points for booking online and paying using Best Western MasterCard. No promotions as of now. You can get a Gold status with Club Carlson by being a Rezidor shareholder. You will earn 8000 Choice Privilege points for every two stays. Note that in lower quality Choice brand a stay is defined as two or more nights for this promotion. This promotion that started on March 8th runs until May 8th. Hilton’s second quarter promotion is for double points or miles. You need to choose one or the other, and you cannot change your selection. You should sign up for the two promos below. Even if you are Diamond with Hilton, you can still get 40K HH for four Hilton stays. Instant Hilton HHonors Gold Status for Visa Infinite Card Holders + 40K HHonors Points After Four Stays (For All? Hyatt has teamed up with number of airlines; Air China, Air France-KLM, ANA, American Airlines, British Airways, China Eastern, Delta Air Lines, Etihad, Lufthansa, Qatar, Southwest, and United to offer up to five times the miles or points. As always, Priority Club has number of promotions that you should sign for. This time Priority Club has two parallel promotions. One is based on nights and the other is based on stays. You can earn 5000, 10000, or 15000 depending how many nights/stays you have during the promotional period until June 30th, and to which promotion you sign up for. Currently there are six different one time Priority Club bonus points offer that you should sign up for. Then IHG has teamed up with Visa to offer you 1000 Priority Club bonus points for registering your Visa card + an additional 5000 points for using the same card to pay for a stay by July 31st, 2012. You can earn 2000 Priority Club bonus points for just signing up for three different Priority Club programs (no purchase required). Priority Club is offering 5K/10K/15K bonus points for 3/5/6 nights at InterContinental hotels in the Americas and the Caribbean by the June 30th, 2012. Marriott’s nest promotion starts on June 1st, 2012 and has the usual number of different variations. Starwood just launched their much anticipated SPG Nice Choice promotion that hasn’t gone down too well. You can read about the initial leak, my ability to confirm that the leaked information was real, and the strategy that you should take. Essentially, this is a double or triple Starpoints promotion that is very weak compared to free night promotions that SPG was running during 2010 and 2011. Starwood seems to be promoting their Sheraton brand hard these days. There are three different promotions for Sheraton stays going on. There is a promotion of 1000 extra Starpoints for booking a Club accommodation at Sheraton hotels and paying using an American Express card. Some renovated Sheraton hotels are also offering 1000 bonus Starpoints. Wyndham has two promotions. One is for North America (US, Canada, and Mexico) and the other one is for rest of the world. In my opinion the rest of the world is better. The last week of Daily Getaways are finally out as well. Just a note. The better offers seem to sell out almost instantaneously, and it might be difficult to get into the deals. On this final week the Hyatt’s offer is really good, but the number of packages that they have available for sale is very low. I think that it is going to be borderline impossible to buy even one of them. You can get additional 10% discount off these prices, if you pay using an American Express branded card. You can buy 5 sets of this offer. Hyatt Gold Passport points at these prices is an excellent deal. You are only paying about a cent for a point. You can use 22K Hyatt Gold Passport points for a night i.e. at the Park Hyatt in Sydney or Maldives that are going for $500 to $800 per night. You can buy one each of the Hyatt’s four offers, but I don’t think that it is possible due to the extremely low number of packages being sold. You can buy two sets of each of these two offers for maximum number of four packages. Last year, Club Carlson was running an excellent promo for 50K Club Carlson points for a one stay. If you were able to find a property at a low price, you could have gotten 50K points for far less than $100. There are some Radisson Blu properties that are very expensive, and buying points and then paying using points can make sense.